7:30am — Breakfast, with a roundtable discussion that asked the question “Is Cheese The New Wine?” The most interesting part being a discussion of how the California wine used to use European appelation names (“Burgundy”, “Chablis”, etc.) to name their wines early in the modern growth of American wines, but that has evolved to developing it’s own labels (“Napa Cabernet” says much more today than “California Bordeaux”). This could be applied to American cheeses, where some bloomy cheeses in the US are still labeled as “Camembert” at the same time that other US cheese producers are developing their own nomenclature for the same type of cheese. 10:15am — Extend Age of Bloomy Soft Ripened Cheese presented by Brian Humiston based on the research at Oregon State University he is doing with Lisbeth Goddik. This is an amazing investigation into what can be done to stabilize bloomy rind cheeses to maximize their shelf-life. Basically the answer lies in retaining as MUCH calcium in the curd as possible, which enhances the stability of the cheese through the aging process. To do this, Mr. Humiston (whose camembert-style cheese won 2nd place last year in the cows milk bloomy rind competition) Mr. Humiston vat pasteurizes the cheese, re-acidifies the cheese to exactly 6.50pH, adds CaCl2 to the milk, then re-pasteurizes the milk after holding it overnight at 55 deg F. In addition, he uses Streptococcus thermaphilus instead of the traditional MM100 culture to get a very fast high temp fermentation, plus the St are less proteolytic at the aging state than is MM100. Of course he lays out all the details and reasoning in his presentation, most of which is captured in his slides. I made sure I picked up extra hand-outs of the slides to bring back with all the details. Even better, he brought four versions of the cheese he’s been making for his study, two calcium stabilized versions, and two traditional recipe versions (one each aged at 43 deg F, and 37 deg F (see picture above) made on the same day (19 June) and we got to taste these along with a real Camembert from France (Le Chatelain). At 36 days old, the traditional high temp cheese was way droopy with the classic musky strong over-ripe flavors while the stabilized high temp cheese was buttery, though with a hint of ammonia. 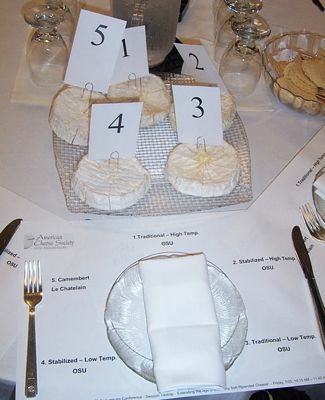 The traditional low temp cheese was everyone’s favorite: buttery and rich with a semi-solid pate. The stabilized low temp cheese was still very sold but had that peach fuzz pasty texture and a much less developed flavor. The Le Chatelain (age unknown) was very solid as well, but instead of the pasty peach fuzz (which tells me that it’s not early in the ripening), it was just plain and boring…hmmm. 1:45pm — Select Suitable Cheese For Extended Aging with cheesemakers from Widmer Cheese Cellars, Beecher’s Handmade Cheese, and Cabot Clothbound Cheddar with Jasper Hill. I lucked into another seminar that included a tasting component: we had six slices of cheese on a plate to taste — a young version and a fully-aged version of their cheddar. It was a really good illustration of how aging truly can change cheese into something special, but it’s not without risk. The other interesting comparison was that Widmer aged in plastic for up to 10(!) years (which we tasted), and both Beecher’s and Cabot Clothbound are natural rind versions of cheddar that are typically sold at 12 to 24 months old. We learned a lot about each of the challenges (cheese mites! answer: vaccuum cleaner!) in the production of these special efforts, and also the choices that are made with each batch. At the end, they’re trying to make a cheese that sings on the palate, and they’re pretty successful at doing this consistantly. Posted in Guild and tagged ACS, Aging, Bloomy Rind, Camembert.